A big-hearted, compelling, zany, funny, fast-paced novel. It takes courage to believe in your dreams, and after heartbreaking failures, it takes courage to go on dreaming. Returning to America in the twilight of his life with an old valise, an irascible parrot, and an expired U.S. passport, Benjamin East still dares to dream big. When Benjamin meets Amy McCafferty, they recognize in each other an unbreakable belief in infinite possibilities. Mary Catherine Swanson, the educational pioneer profiled in Wall of Fame, was named “Teacher of the Year 2000” by Time magazine and CNN. Swanson founded AVID (Advancement via Individual Determination) in 1970. From one classroom with 32 students, it has spread to hundreds of classrooms and tens of thousands of students across America. Brought together by a freak coffee frost, four strange, fantastic, and unlikely heroes embark on an epic quest to free oppressed coffee workers of a Brazilian plantation from their manipulative, greedy and unrelentingly racist overlord. But what can a nutty watermelon-shaped man, a spurned she-lawyer, a frustrated journalist, and a misanthropic parrot do against the power of the Brazilian coffee cartel? Contemporary literature for youthful adults, mature young people, and ageless seniors. 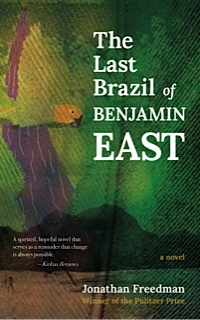 Pulitzer Prize winner Jonathan Freedman’s Everyman, Stanley Scuka, embarks on a Brazilian adventure to save the world. Freedman illustrated the book.